So after removing the sticky stuff with nailpolish remover the pools looked cloudy against the light. I tried some polish (maybe I got the wrong one) which didnt work to make them clear again. Then I applied some gloss varnish which made them shine but they looked like it was just a layer of paint all of a sudden, with the nice see through quality of the pool not coming out at all. So I took of the gloss varnish again. I am still trying to figure out how the remove the cloudiness. I think there must be a solution, because when they are wet with a little water, they look great. Did you figure out how to clear the cloudy pools? I had the same issue with my passage set and the nailpolish remover worked with removing the sticky/tacky surface grime. Someone must have added a layer on top or something. I can see through the clear resin to the ground now and its shiny when wet, when it dries the pools surfaces are a bit cloudy/mat. No big deal really, would be cool though if I could get the surface glossy again. They look 1 million percent better. Good job! I would second Oldent's idea of floor polish or just use something like Reaper or Vallejo's glossy sealer. Personally, I’d use satin instead of gloss. The shine on gloss is so high, it might keep you from seeing all the cool details in the water. YMMV. One possibility would be to just add some nail polish over it. When it dries, it should be ok.
Glad you got it figured out and that they are not someone's recast! This looks like old Stillwater or Modge podge. The nail posh remover worked so they may have tried to add nail polish as a gloss coat. 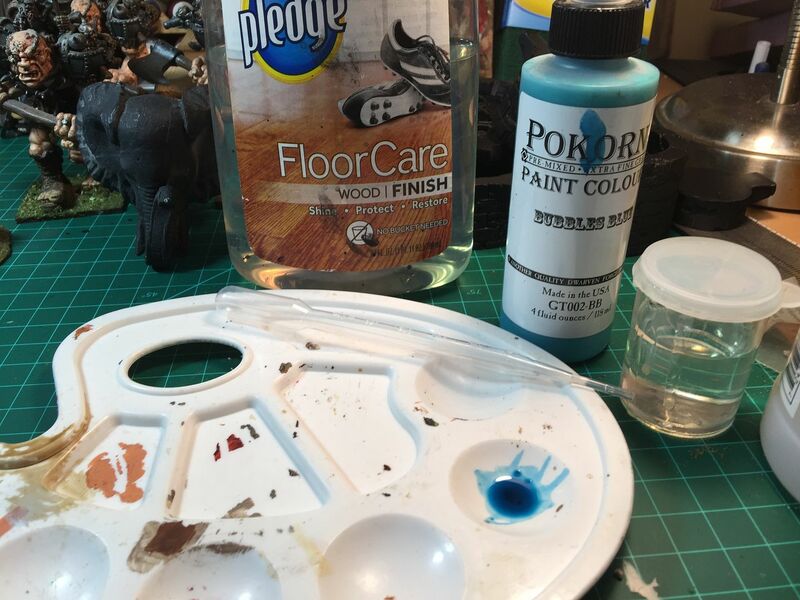 Use floor polish like pledge to put a gloss back on it. If it gets yellow over time you can remove it with vinegar. This product does not turn yellow and can be easily removed. You can thin paint with it too.